Women-centric roles though not so common among Bollywood films, have a special kind of effect on people. In the times when women are fighting furiously over their rights, films that highlight women strength are a huge strengthening factor and good business too. These types of films give the fighters a boost which they require so much. While the content of the film is irrelevant, the development of the female character in the movie makes all the difference in the film. Although a better story is what makes the film, a movie with a strong woman role but not as strong a story is also a profitable investment for the producers because of the support it gains among men and women. This is the reason the few number of films that hit the screens leave a mark in the hearts of the people. But pulling off women centric role is not everybody’s cup of tea. Only some women actors in the Film industries excel in this area. In regard of these daring actresses and in remembrance of the roles they’ve played, we have made a list of such actresses. Check it out. Who else is a better example of such roles? Vidya Balan who is reputable for taking up strong women characters in films like The Dirty Picture, Kahaani, Begum Jaan etc., is a role model for all the women in India. Vidya Balan is known for her support of feminism women-centric roles. Though a relatively young actress in comparison to the veterans, Alia Bhatt did some remarkably strong roles in her few films. Her role in films like 2 states, Humpty Sharma Ki Dulhania, Highway, Dear Zindagi, Udta Punjab etc., have earned a reputation ascending her into an establishing place in Bollywood. Nayanathara landed a rather powerful role in the female-centric film Maya. In a place where the kind of films, are not that reputable amongst the audience, Nayanathara was able to pull off a blockbuster hit, filling the female audience with a new energy. The actress is looking to do more women-centric films and is said to have signed with various directors who are more than enthused to encash the opportunity. Yet another actress from the Tamil industry who made a smashing comeback with the film 36 Vayadhinile. Jyothika who did a fantastic job playing a middle-aged woman. The film which portrays a story that is unusual to the Tamil industry carries an empowering message to all the women out there. Parvathy who is well known to the Malayalam audience is known for her strengthening roles and splendid performances. The actress who is 29, became familiar with the rest of India with films like Bangalore Days and Uttama Villain. Highly reputed Telugu actress who became well known pan India with her role in Bahubali, Anushka has done some strong characters as well. She established her dominion over this category with films like Arundhati, Rudramadevi etc. The actress who is looking forward make some more films of this genre has already signed some in the recent times. 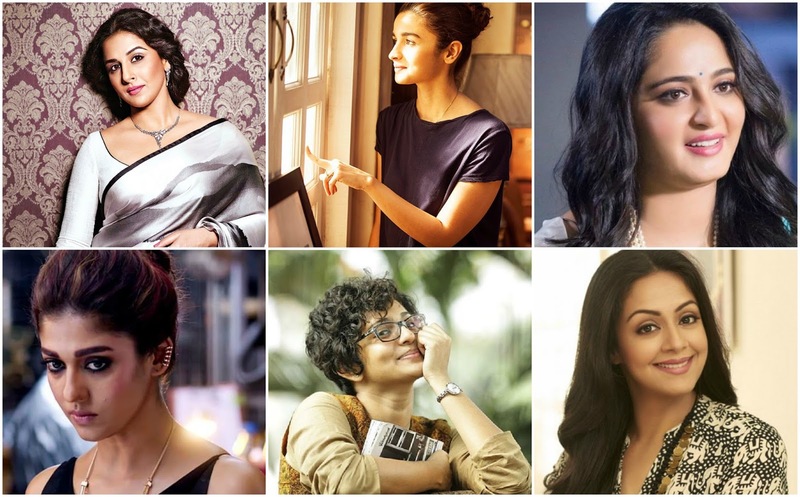 Plenty of other actresses like Sonam Kapoor, Sonakshi Sinha, Trisha, Sri Devi, Madhuri Dixit etc., have made films with strong female characters which proved to be empowering and were successful at the box office.